One of the reasons we love living in Florida is that we literally have multiple amusement parks in our backyard. We have annual passes to Busch Gardens and the zoo, so I often take the kids to the parks alone for just a morning play date. With our annual trip to Disney World coming up as well our first trip to Sea World, I thought this would be a great time to fill you in on what essential items we need when going to a theme park. 1. BOB Duallie- I can't say how much I LOVE my BOB! 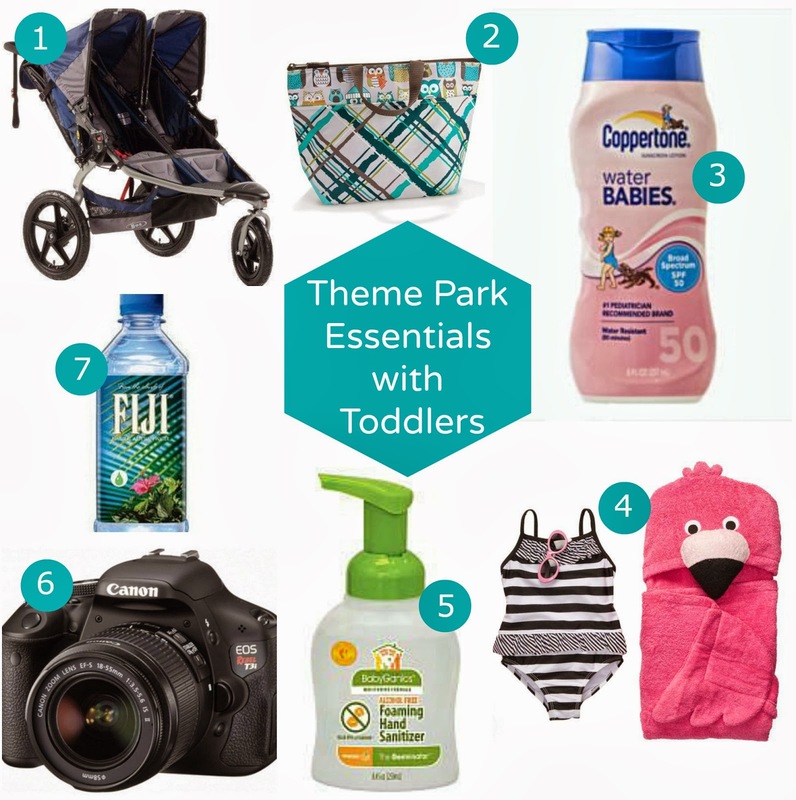 It is the perfect stroller for the theme park because it rides smoothly, reclines so the kids can nap if they need to, and has huge sun shades for those hot Florida days! You don't need this exact stroller for the park, but I would definitely recommend something a little more comfortable than an umbrella stroller. 2. Thirty One Thermal Tote- This tote is not only a theme park essential, but an every day essential. Since a lot of theme parks don't allow coolers, this is the perfect tote to throw a couple of ice packs in and load it with a few snacks or drinks! Definitely check the rules before taking this into a park because some do have their restrictions, but whenever attendants see two toddlers or babies they never usually mind the snacks. 3. Sunscreen- Living in Florida sunscreen is just another item I have to keep in the diaper bag. For a day at the theme park I make sure to put it on the kids (and me too) at the beginning of the day and reapply depending on how long we are there for. 4. Bathing suit & Towel- (and swim diapers if needed!) Most of the theme parks we go to have splash areas that the kids can play in so I always have a bathing suit and towel just in case. It's usually the day I don't have it when we really need it! 6. Camera- A camera is a necessary to catch all of the cute moments, but I usually just have my iPhone for a casual play date at the theme park. If we are going to Disney or a park we don't often go to I won't hesitate to bring my DSLR. I brought it to Disney for the first time last year and was able to capture such beautiful moments with it! I had no problem bringing it on all of the rides with me either since they were all toddler friendly. Most theme parks have lockers as well if you need to store it for a bit. You can find some of these items in my Mommy Must-haves post here. You can also see our trip to Disney I referenced here. And if you still don't believe me on how much I love my BOB stroller click here. I always forget swim/water gear! Most parks have something for the kids to splash in, and it is a great way to have them cool off. Great idea.